Eastern High School’s Allie Grueser chips on to a green at the Meigs County Golf course on August 14, 2014. 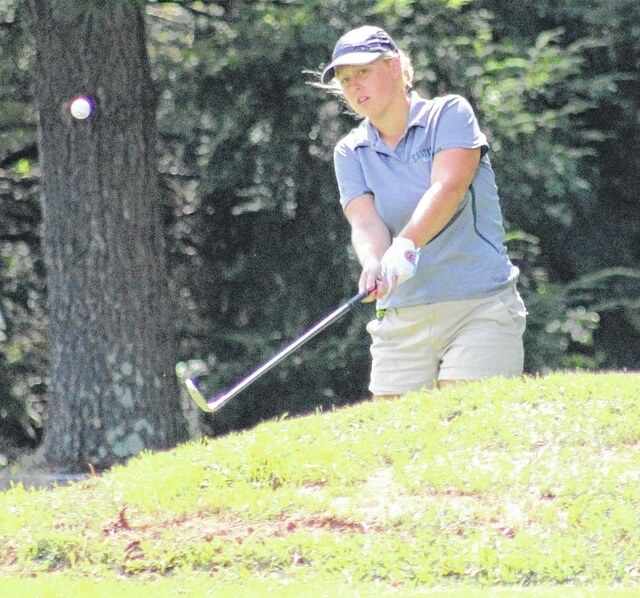 Grueser won the Tri-County Golf League’s girls division on Monday at Hidden Valley. POINT PLEASANT, W.Va. — The Frank Capehart Tri-County Junior Golf League opened their 2015 tournament schedule on Monday at the Hidden Valley Golf Course in Mason County. The day began with warm temperatures and high humidity. The rain forecast for the day held off until just after the tournament was completed. The competitors showed that their golf games were a little rusty. However, there were many excellent shots and the scores will probably improve as the season progresses. Zach Morris from Vinton, Ohio was the only player in the 18-19 year old age group. His score of 52 gives him an early lead in the group and the first place trophy for the week. The 15-17 year old age group had the largest number of players. Six boys and three girls participated. There was a tie for first place in the men’s division with both Levi Chapman and Douglas Workman shooting a fine score of 41. The points available for first and second place will be combined and split between the two leaders. Jonah Hoback carded a 47 for the day to take third. Bryce Swatzel, Dalton Dangerfield and Tristan Davis also played in this category. Allie Grueser shot a 52 to win first place in the girls division. Mersadies Markins score of 63 placed her second while Catelyn Edwards carded a 64 for third place. Colby Martin turned in a good score of 44 to lead the 13-14 year old age group. Brayden Ervin shot 53 to finish second while Landon Acree carded a 55 to finish third. Carl Sayre’s 56 was fourth with Nicholas Durst finishing fifth with a 59. The only player in the 11-12 year old group was Easter Swain giving her both the first place points and trophy for the day. Sam Arnold was the leader in the 10 and under age group shooting a 56 in the boys division. Newcomer Grant Roush finished a close second with a score of 58. Ali Norris was the only girl in this group. Her score of 72 gave her the first place trophy for the day. The second stop on this years tour will be Monday, June 22, at the Meigs County Golf Course just outside of Pomeroy, Ohio. Play is open to all area youth. There is a fee of $10 which includes the golf and a small lunch afterwards. Registration begins at 8:30 a.m with play starting at 9 a.m. Questions can be answered by calling any of the following: Jan Haddox (304)675-3388, Jeff Slone ( 740) 2566160 or Bob Blessing (304) 675-6135.